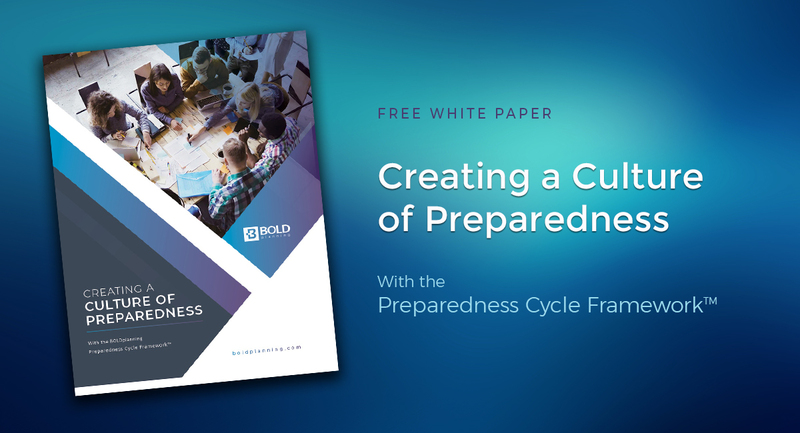 White Paper: Creating a Culture of Preparedness with the Preparedness Cycle FrameworkTM – BOLDplanning Inc. Creating an external “culture of preparedness” within communities is a worthwhile goal. But achieving this means emergency management agencies must first lead the charge by creating an internal culture that fosters best practices and is committed to strategic planning disciplines. While it’s true emergency management agencies are, by definition, dedicated to preparedness, most leaders will admit there is room for organizational improvement. To improve departmental and community readiness, consider following the Preparedness Cycle FrameworkTM, a five-year cycle of integrated planning, exercising and technology implementation. Find out more about the Preparedness Cycle Framework.